We have collected and analysed 41 expert reviews and 1159 user reviews from international sources. Experts rate this product 79/100 and users rate it 86/100. The average review date is 16-03-2016. We have compared these reviews to 367686 reviews from other Camcorders. The alaScore™ for this product is 96/100 = Excellent. Last update: 18-04-2019.
alaTest has collected and analyzed 96 user reviews of GoPro Hero4 Session from Amazon.co.uk. The average user rating for this product is 4.5/5, compared to an average user rating of 4.0/5 for other Camcorders on Amazon.co.uk. Comments about the battery and size are overall positive. The price and portability are also appreciated, whereas some have doubts about the image quality and reliability. 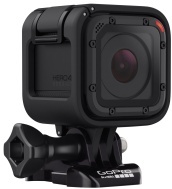 alaTest has collected and analyzed 482 user reviews of GoPro Hero4 Session from Amazon.com. The average user rating for this product is 4.0/5, compared to an average user rating of 3.9/5 for other Camcorders on Amazon.com. Opinions about the design and price are generally positive. The size and portability are also mentioned favorably. The viewfinder and memory get less positive views, and there are some mixed opinions about the connectivity. GoPro Hero4 Session review: Ousted by the Hero 5 Session? Current and future owners of the company's latest high-end cameras will get a firmware update for six new features for photos and video. The waterproof cube-shaped camera is the company's smallest, but it looks like it'll take an equally petite price to spark sales. The new model sheds the touchscreen of its linemate, the Hero+ LCD, sliding in under that model, but above the very basic Hero.